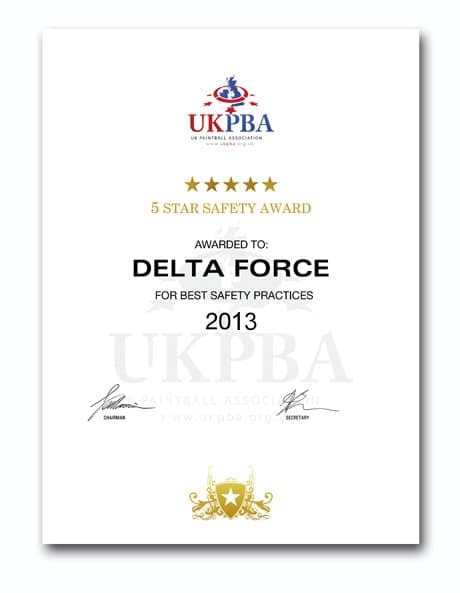 Delta Force Paintball has been credited with a five star rating for outstanding health and safety standards by the sport’s governing body – the UK Paintball Association (UKPBA). The UKPBA is a non-profit making body that was established in 1989 to protect and promote the sport of paintball in the UK. Accredited members are recognised for their contribution to paintball in the UK and Delta Force has been commended for their continued efforts in developing and implementing safe practises to ensure a world class safety record across their network of paintball centres. Delta Force prides itself on maintaining their reputation of providing customers with an exciting yet safe day out. With over 40 trade members, the UK Paintball Association is responsible for the promotion and protection of the sport of paintball in the UK and ensures all members adhere to certain health and safety regulations, and maintain the appropriate standard of paintball centres throughout the UK. So if you’re looking for a venue for your next paintball day out, choose Delta Force Paintball – the safest and smartest choice.